False blue indigo (Baptisia australis) is a sturdy North American native perennial with a rugged constitution. Beautiful blue flowers, handsome foliage and stately presence make it a perennial garden must-have. Unfortunately, this fine plant is not very well known to gardeners – despite the fact that it grows wild from Ontario to Texas. But that should change as a result being named the 2010 perennial plant of the year by the Perennial Plant Association. Cultivated since the 1700s, this plant got its common name when it was used as an inferior substitute for indigo blue dye. The tidy, rounded plants grow 3 to 5 feet tall, and look like shrubs when not in bloom. The 12 to 24 inch flower racemes resemble lupines, and are held above attractive blue-green foliage. 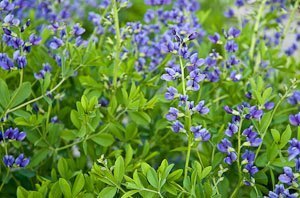 But once established, it’s a winner: Baptisia is long-lived and not bothered by pests, and is deer-resistant. Best of all, it tolerates drought and heat, while still looking fresh. 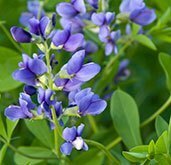 False blue indigo blooms for about three weeks in late spring to early summer. Black seed pods develop after flowering. Some gardeners deadhead them, but they are attractive enough to leave in place or use for flower arranging. Baptisia blooms best in full sun. In shade, the plants sprawl. Fertile, moist soil is ideal, but it tolerates most soil types. Roots grow deeply, so plants usually take a season or two to establish before growing to mature size. Division is not recommended due to deep rooting, but some gardeners have had success by dividing in early spring, so it’s unclear if this caution is fact or fiction. White False Indigo (Baptisia alba) has half inch white flowers that are not as closely set as the blue species, but which are enhanced by charcoal gray stems. Flowering is earlier and plants tolerate more shade than B. australis. Grows 2-3 ft tall and wide in zones 5-8. Yellow False Indigo (B. sphaerocarpa) blooms at the same time as B. alba and has brilliant yellow flowers. Softer shades of cream or yellow flowers are common and belong to one of several other yellow-flowered species. Some yellows will produce flower racemes that are more horizontal than vertical. Plants grow 2-4 ft tall and wide in zones 5-9. Hybrids: Recent hybridization is increasing the size and quality of Baptisia and giving us a better range of flower colors. A few of current hybrids available include ‘Carolina Moonlight’ – light yellow flowers on 2-3 ft tall plants; ‘Purple Smoke’ – smoky purple flowers that persist for 4 weeks on 4-ft tall plants; ‘Twilight Prairie Blues’ – yellow and purple bi-color flowers on vigorous 4-ft tall plants.